The concert is sold out! Please arrive early for the doors will be closed once the concert has started. Teppo Mäkynen is not only a virtuoso drummer but also a talented composer and a true visionary of music. 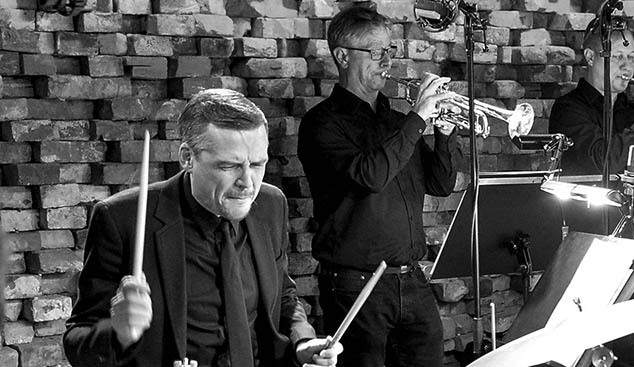 As UMO Helsinki Jazz Orchestra and Mäkynen join their forces, we are guaranteed a true Mäkynen extravaganza. The programme consists mainly of brand-new big band arrangements of Mäkynen’s compositions. In addition to them, we will hear carefully chosen bits from his big band portfolio. The drummer’s groove and spectacular mastery of ride cymbal is certainly met with some foot tapping. Mäkynen’s use of electronic equipment makes the live concert experience even more exciting. Conductor: Mikko Hassinen. The Finnish jazz folk know Teppo Mäkynen from the groups The Five Corners Quintet, Jo Stance and Teddy’s West Coasters, to name a few. He is also a sought-after record producer and DJ in the field of Finnish jazz. Please note! The concert will be held in the Savoy Theatre at 12-13. The admission is free but it is recommendable to book a ticket in advance at the Savoy Theatre box office (0 €) or Lippupiste (0,5 € + commission). Pre-tickets admit the audience until 11:50am, after which the remaining seats will be given to customers without a pre-booking. Please arrive early for the doors will be closed once the concert has started. Production: UMO Helsinki Jazz Orchestra, Savoy Theatre & Restaurant Presto.